This painting is titled "What the Fish was Silent About". It was created by Surealist artist Vladimir Kush. It is a picture of a fish whose scales are made of gold coins. I found this picture very interesting. 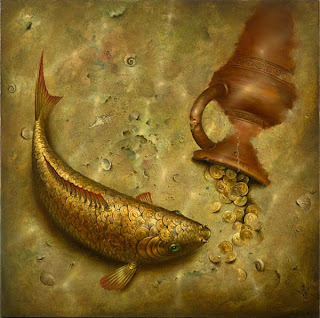 In order to see the gold coins the fish is made of, you have to really concentrate in on the fish. The gold coins are also placed near the fish so you can see that it is what the fish is made of.